Just like the film itself, I will get straight into it. When I first saw the trailer to this film, I initially looked at the cast and thought, what the hell is Owen Wilson doing in a serious role? I’m so used to him being stupid in annoying comedies (although somehow I am guilty of liking the Wedding Crashers; despite it also having Vince Vaughn who I equally despise), but this looked completely different for him. From its trailer my attention was captured; the action packed scenes and realistic plot- disturbingly reminding me of the events of the recent tragedy in Tunisia. So, on to the film itself. 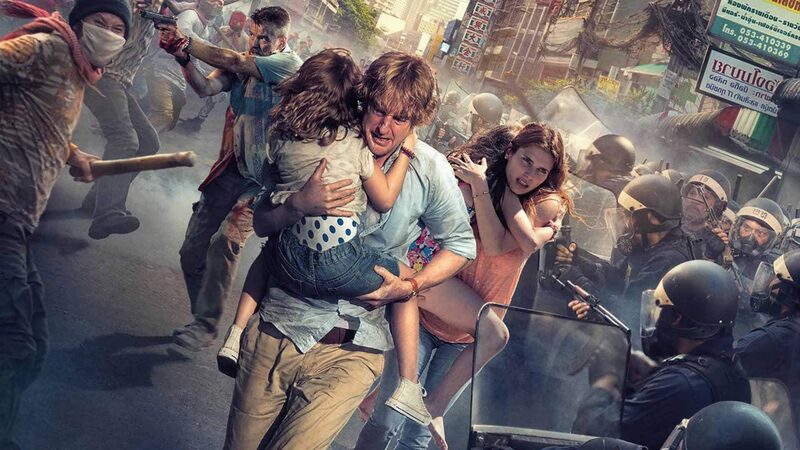 Once I settled into familiarizing with Owen Wilson’s role as the father of the Dwyer family (with Lake Bell as his wife), from the outset I gathered that the peaceful beginning was leading up to something not only terrifyingly realistic but also brutal in a way that; although clearly is fictional, was undoubtedly hard to watch. The brutality and sheer ruthlessness is shown in the film, keeps you at the edge of your seat making you cheer on the Dwyer family, desperately wanting them to escape. The filming of this motion picture itself is mostly shot in a hand-held-in-the-moment type recording, with a number of sudden jolts. Although some people would probably find it hard to keep track of what is happening by the second, in my opinion I think this makes you feel like you are there — in the action, experiencing each moment like you are facing the same scary ordeal. What I liked about this film (in a non-eerie way), was the fact that it had unexpected moments which I certainly did not predict. I will not give these away on here as obviously, I would recommend for you to see this for yourselves, but all I will say is that this film was exciting from start to end. It reminded me of the film The Impossible, taking a concept which not that you can necessarily yourself familiarize with, but is realistic enough that you can watch it and appreciate the acting of the cast within. I will have to say I was very impressed with the acting of Lake Bell and Owen Wilson, taking a story that was probably very hard to film, yet filled it with the emotion it deserved. I'd certainly recommend this, as I would have to admit it kept me on the edge of my seat and kept me guessing as to what would happen next.